Lincoln, Neb. 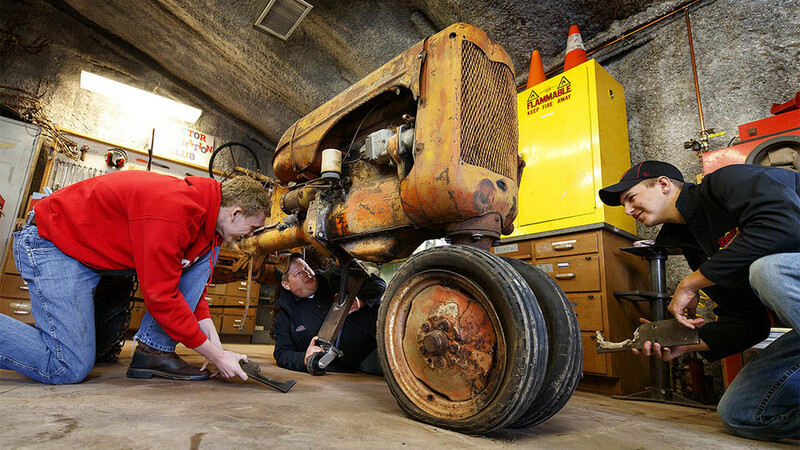 — For a small group of students involved with the Tractor Restoration Club at the University of Nebraska-Lincoln, fixing up tractors from their great-grandparents' era is a key part of college life. Typically, club members aim to make their projects run like new and gleam like they're fresh from the assembly line. Their goal with this rusty, lichen-encrusted machine will be to stop its deterioration so it can survive as a testament to one homesteader's grit. It is the first time in Levitan's 35-year career as a conservator that he has helped prepare a tractor for a museum exhibit, though he has worked on other large objects such as stagecoaches, mining equipment, automobiles and horse-drawn carriages. Doug Koozer, a club adviser and president of the Friends of the Larsen Tractor Test Museum, met Levitan in Alaska to help rescue the tractor. The model is far from rare – about 84,000 were manufactured at the company's Wisconsin plant – but this specific tractor has a special story. It was lifted by helicopter in June from a roadless site in Alaska, the last land in America to be claimed under the federal Homestead Act of 1862. Homesteader Ken Deardorff used it to clear hundreds of tree stumps to farm the land as required by the homesteading law. Club president Joshua Bauer said he was in disbelief when he first saw the tractor after it was delivered in August to the club's East Campus shop. "It was an incredible undertaking to go all the way to Alaska to get that one tractor," he said. "Now it's actually here and it's my responsibility. We'll never get to do something like this ever again. It's truly a once-in-a-lifetime experience." Mark Engler, superintendent at Homestead National Monument of America, said the tractor is an "American treasure." The involvement of the Larsen Museum staff and the restoration club have been critical to the effort to save the machine and tell its story. "We can't thank the tractor club enough for assisting us with this project," said Diane Vicars, president of the Friends of Homestead. "Being able to get this tractor in condition for display in the lobby of the Monument's Heritage Center will complete yet another amazing chapter in both the nation's homesteading story and its agricultural history." The students are among tens of thousands of people across the country who are interested in antique farm machinery. More than 23,000 people, for example, follow an Allis Chalmers Facebook page, while 50,000 subscribe to Antique Power magazine and 25,000 subscribe to the Green Magazine for John Deere aficionados, published in Bee. Almost every weekend there's a farm mechanization festival somewhere in the United States. National directories list scores of clubs devoted to the interest. The club reflects the university's history and mission in agricultural education, particularly its nationally recognized tractor test laboratory and the Larsen Museum. But it also fits more recent emphasis on "maker" activities, where students learn creative ways to solve problems by mastering skills like welding and engine repair. "It's a change of pace for the students and lots of practical aspects, though not many of them are going to end up in the tractor restoration business," said Milford Hanna, a retired biological systems engineering professor and an adviser to the group. "They come from all different backgrounds, from all across the university. And they are always working on tractors. That's what it's all about. You can't even imagine how dirty they get." Koozer, a tractor restoration expert from Cheney, has been in the antique tractor business for 30 years. He said the project provides students a deeper perspective on their restoration efforts. "Do you want to paint it up so it looks pretty? Or do you want it to be historically authentic?" he said. "There’s probably a hundred of this model between here and Alaska. The best story is to talk about it the way it is. I would say this tractor has lived a hard life." Levitan said the tractor brings the American homesteading story full circle, by bringing an artifact from the last homestead site to the first homestead site. The Homestead National Monument of America is at the site claimed by Daniel Freeman on Jan. 1, 1863. ”It's the last chapter in the homesteading story," Levitan said. "It helps show the difficulties faced by homesteaders in the 1860s and homesteaders in the 1970s."